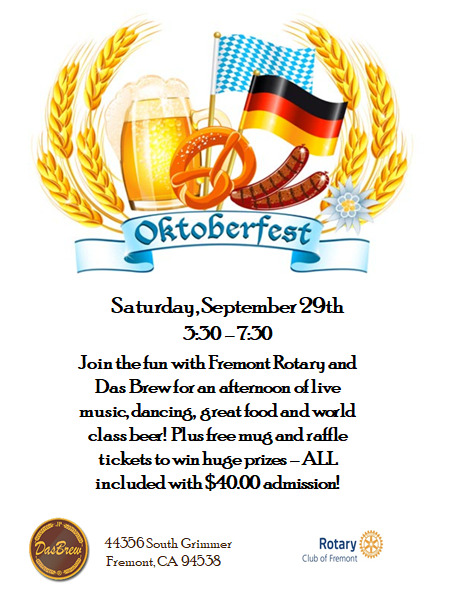 Join the fun at Das Brew for an afternoon of live music, dancing, great food and world class beer! Saturday, September 29, 2018. We have an exciting lineup of guest speakers, forum presenters, raffle prizes, and more! Sign up now if you have not done so yet! 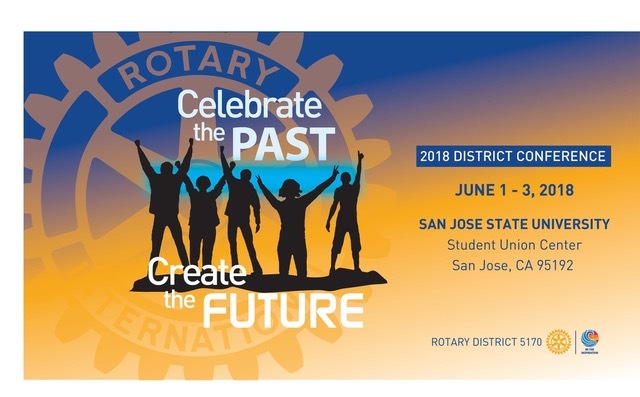 Join us June 1-3rd at San Jose State University. 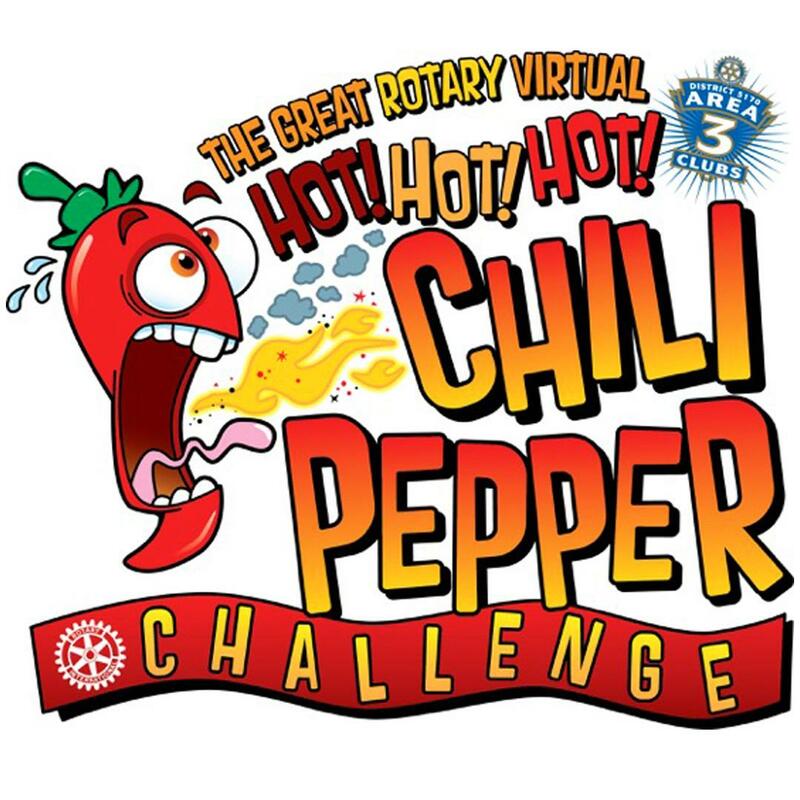 As Thanksgiving approaches, the Rotary Clubs of Area 3 would like to share thanks for the Rotarians, sponsors, and all the family and friends who contributed to the 2017 Rotary Hot Chili Pepper Challenge. We'd also like to thank our incredible nonprofit partners for actively working with us to make this drive a success. We have exceeded our $40,000 goal by over 50% because of the generosity of people just like you. We raised $64,000 for local charities - because of the generosity of our wonderful sponsors and individual donors. Coming together like this is what Rotary is all about, and we are most thankful for your support. Scroll down to see the list of donors to the Hot Hot Hot Chili Pepper Challenge! It's never too late to give! 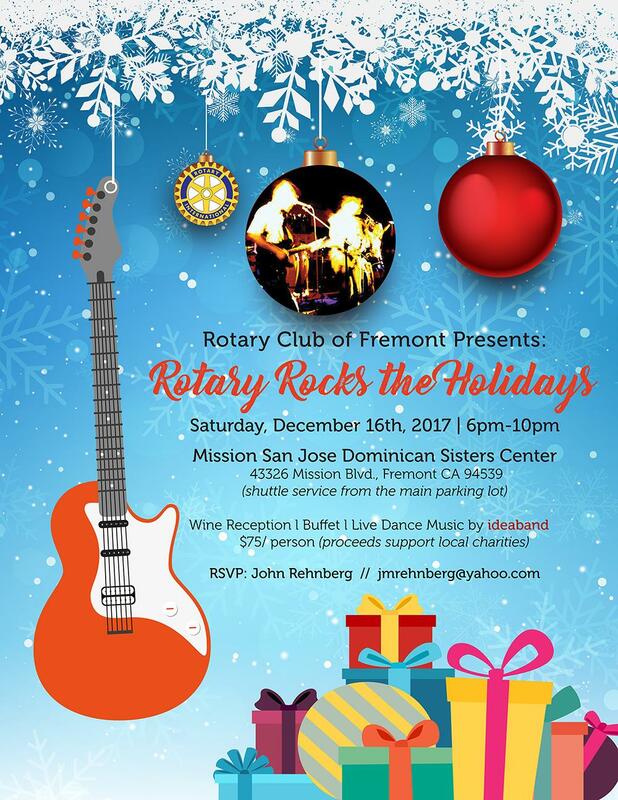 Our club's debut event, Rotary Rocks the Holidays, will be held on 12/16/17 at the Dominican Sisters Center, Fremont. There will be a wine/cheese reception, three courses buffet dinner - Carved Beef Tri Tips, Poached Salmon and Citrus Glazed Chicken, raffle prizes and "Oldies but Goodies" Classic Rock live dance music by the IdeaBand. We'll also play some of the newer songs for the younger members. Hope you will like our music. Please consider hosting a table of (10) and invite some of your friends/relatives, clients or some of your staff to kick off the Holiday celebration. 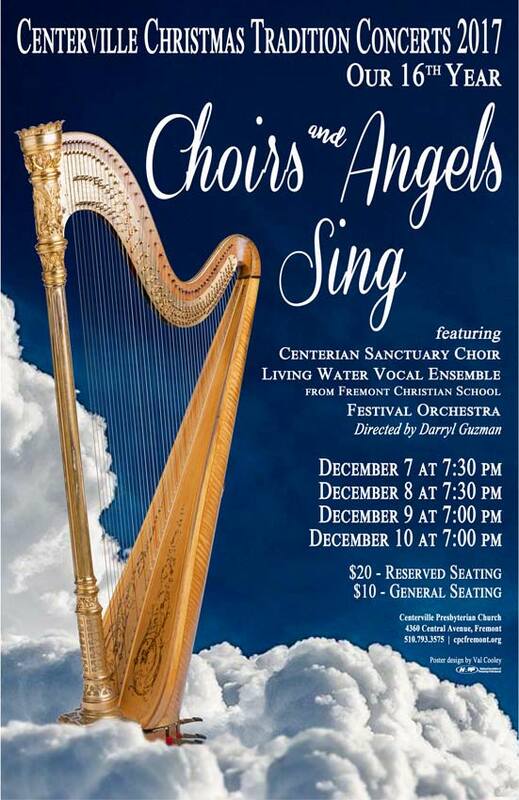 You can treat your guests or collect $75/person (checks payable to Fremont Rotary Club) and forward them to Marlene on or before the event date. Please note that the table will be reserved under your name and your guests only need to mention your name when they check in and they will then be directed to your assigned table. This will largely reduce Marlene's ticket collection and registration workload. I am happy to answer any questions that you may have on Wed when we see each other! Thank you very much for your participation and support of the club! to grief counseling services and much more. “The goal of our committee from day 1 has been to find the holes in the system and get the help to where it is needed most and do it with zero overhead costs” said Ron Roberts, President of the Lake Area Rotary Club Association. Their flagship program, the Business Recovery Grant Program, provided over $250,000 in assistance to small businesses affected by the fires. CONGRATULATIONS! TOTAL RAISED SO FAR: $48,618! Thank you to the Rotarians of Area 3, our sponsors, and all the community members who are continuing to contribute to the challenge. We have exceeded our $40,000 goal because of the generosity of people just like you. We exceeded our $45,000 goal because of our wonderful sponsors. Why not contribute a little more in our final week so we can raise over $50,000 to donate to our charities. This is what Rotary is all about! Let's see if we can make it by the end of October! Scroll down to see the growing list of donors to the Hot Hot Hot Chili Pepper Challenge! Just Click the Donate Button on the Chili Pepper Challenge Website! Niles Rotarian Sophia Ahmad is launching a new tequila brand called Blue Iguana, and with help from Daren Young they turned a launch party into a fundraiser for the Chili Pepper Challenge and raised $500! Watch and learn. We are counting on every Rotarian bringing in a minimum of $75.00, but we also want to build awareness in the community and raise even more money for charity. Donate online. Add the appropriate hashtag in the "notes" field. Play the Hot! Hot! Hot! Chili Pepper Challenge with your own video challenge. Check for more tips. Beneficiaries will partner with their sponsoring Rotary Club to bring in donations, and Rotary will match them two-to-one up to a $5000 combined amount. Donations above this amount go to the charity without the match. When you make a donation or post a challenge, use the hashtag for your charity or club. The two Rotary charities will be grandfathered in and will receive a donation from the proceeds. Their hashtags are just for fun and to call attention to our work. Post a video on social media that communicates you made a donation and ate a chili pepper. Challenge two more people to do the same. Each person makes a donation, eats a chile, challenges two more friends, posts the video. Include info about the project and link to the donation page. Local podcaster Remy Fortier's hour-long interview with Area 3 Rotarians and nonprofit leaders is a "must hear" for all Rotarians and especially for any potential CPC sponsors! "At the start of this interview, I noticed a gallon size bag of chiles sitting on the table in front of us. My first thought was, I hope they won’t expect me to eat a chili and then give an interview! Of course, they didn’t. They are representatives from all the Rotary Clubs in the Tri-City Area...They are givers, people who get involved and take actions to help out those in need. Locally and all over the world." Rotary Speech Contest. Four contestants. Matt Sheldon of Fremont Police Department discusses crime and traffic trends in the city. Ron Hori - Does your club need more fundraising? Rest in peace, Jim Sakane. We will miss you greatly. Jill Lublin, author of "Guerrilla Publicity", "Networking Magic", "Get Noticed Get Referrals"
Fremont Rotarians Share their Cultural and Family Holiday Traditions.